Nissan undauntedly continues to prove how it is serious about pickup trucks. 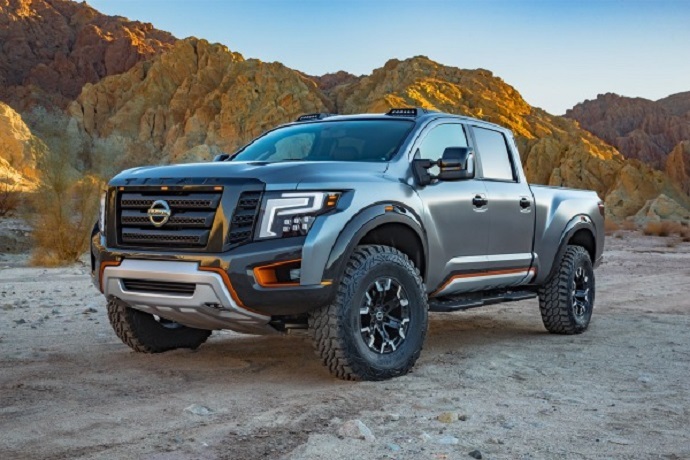 Just a few months after its all-new Nissan Titan XD has started to arrive at dealerships, Nissan selected Detroit Auto Show to show its new concept model called Nissan Titan Warrior. This model has rugged appearance and higher riding height which indicate its off-road orientation. Its suspension has been redesigned while engine is nothing new. Inside it looks and feels modern. The model isn’t expected to go in production but officials said that this concept defines the territory where Titan might go in the future years. When it comes to the design, there is no doubt that engineers has done great job. Nissan Titan Warrior looks amazing and it leaves strong impression. The changes on its exterior are obvious on almost all parts of its body. The front fascia looks more aggressive and modern. The basic shape of the grille is very similar as on the new Titan XD but this version is bolder and looks more aggressive. The grille is flanked by new LED headlights which look futuristic. The front bumper also features modern and aggressive design and it houses massive off-road protective skied plate and on each side are attractive orange accentuated openings. The hood is designed with functional air openings and off-road LED lights which include six units per each are mounted on the roof. The profile side features wider wheel arches which have gloss black flares. The unique 18-inch wheels are wrapped with 37 inch off-road tires. Rocker panels are also uniquely sculpted and accentuated with orange strip. On the tailgate area, notable are attractive taillights, black trimmed tailgate panel and bumper with four exhaust outlets. Inside, model also looks attractive and Magma orange accents are also present inside. They are found on the door panels, the stop/start button, center console and trio of gauges that sit atop of the dash. Bellow the infotainment system, model adds new controls and center console includes cupholders with heating and cooling functionality. The steering wheel also gets new design with chrome trim inserts while carbon fiber accents can be seen around the air vents, on the center console and grab handles. Under the hood of the Nissan Titan Warrior we won’t find any surprise because this model is equipped with the familiar 5.0 liter turbodiesel Cummins V-8 engine which can produce 310 hp and 555 pound-feet of torque. The engine is tightly coupled with a heavy-duty Aisin six-speed auto gearbox and model is also equipped with two-speed electronically controlled transfer case and 4WD. Unlike the engine, the suspension has been heavily redesigned. The front setup includes custom-built control arms, beefier ball joints and coil-over high-performance shocks which feature an internal bypass. Reservoir shocks with an internal bypass, extended axles, new anti-roll bars are used at the rear. Nissan hasn’t announced that any of the features on the new Nissan Titan Warrior Concept will go to the production. However, this model is great promise that shows how Nissan is dedicated to the future of its trucks. It is also possible that Nissan has launched this model to test for response for its off-road truck version.